Magic Kingdom - Walt Disney World Florida - Follow your Disney dreams to a place where storybook fantasy comes to life for children of all ages. Seek out adventures, create magical memories with beloved characters and discover the fun where imagination reigns. Yes...its all here at the Magic Kingdom. The Magic Kingdom® Park is home to many attractions and favorites such as Pirates of the Caribbean, Space Mountain, the Haunted Mansion, Big Thunder Mountain Railroad, Jungle Cruise, It's A Small World and many more! The Magic Kingdom is the top destination for vacationing families worldwide and generation after generation keep coming back to prove it. Daily shows and a parade along with fireworks make your visit to the Magic Kingdom an experience to remember for a lifetime. The Magic Kingdom connects to Epcot via the monorail. Swiss Family Treehouse - This attraction is based on the 1960 film, "Swiss Family Robinson". The movie is about a family that is shipwrecked on a deserted island and how they create a new life for themselves around their new home, a fantastic tree house fashioned from salvaged items and whatever they could find on the island. The Disney imagineers have created this tree house with amazing detail. Enchanted Tiki Room - Experience the zany antics of Iago from "Aladdin" and Zazu from "The Lion King" as they ruffle some feathers in The Enchanted Tiki Room. Under new management, The Enchanted Tiki Room features a witty, upbeat show with several new musical numbers. Pirates of the Caribbean - MUST SEE! - Perhaps Disney's best dark ride, Pirates of the Caribbean takes you from the idyllic Blue Bayou down a waterfall into a pirate attack on a Caribbean seaport. Filled with music and outstanding special effects, this 1967 classic set a standard for dark rides that remained unmatched for more than three decades. Magic Carpets of Aladdin - Disney's "Aladdin," one of the most beloved and popular motion pictures of all time, inspires this colorful attraction, new from the ground up at the Magic Kingdom. Adventureland makes a fitting home for The Magic Carpets of Aladdin, filled with the wonder of genies, flying carpets, magic lamps and Middle East mystique. First permanent attraction with Aladdin theming at Walt Disney World Resort. Adjacent merchandise area of Agrabah Bazaar and Zanzibar Trading Co.
Peter Pan's Flight - Well, your wishes can come true when you follow Peter, Wendy, Michael, and John on their fantasy trip from London, England, to Peter's home in Neverland. "Peter Pan's Flight" is the best ride set within the Magic Kingdom's Fantasyland area. It has all of the magic and fun of the Disney animated classic film and shares it with each and every visitor. Dumbo the Flying Elephant - One of the classic FantasyLand attractions, Dumbo, The Flying Elephant is a childrens ride which is generally enjoyed by kids in the 2 to 7 year age group, and as such is often very popular with a fairly long wait time. Adventures of Winnie the Pooh - MUST SEE! -Visit all your friends from the Hundred-Acre Wood for a "hunny" of an adventure. It's the ride in which you get put in the middle of Pooh's blustery day. You'll bounce along with Tigger. Float through a floody place with Piglet. Even enter the mysterious world of Heffalumps and Woozles. It's a willy nilly silly good time. It's a small world - MUST SEE! - Travel and world and share the love of children, joy and song. This ride has held up nicely over the years and is a must see if you have little ones. Cool, relaxing and the line moves quickly. Cinderella's Castle - Heading out of Liberty Square toward the hub in front of Cinderella's Castle, there's a bridge over the moat and an easy to miss sign saying that this is a good spot to take a photo. It's an especially good photo spot around dusk with the sunset at your back. With the water in the foreground, this might be the best photo spot of all. Snow White's Adventure - Ride on one of the dwarfs' mine cars into Snow White's adventures as the Evil Queen pursues Snow White into scenes from the animated film. Be there as the Evil Queen transforms into a grizzled old hag. Get tempted by the poison apple. Beware falling rocks! Mad Tea Party - Take a whirl on this wonderfully wacky tea party that is right out of The Mad Hatter and the March Hare's "Unbirthday" party in Disney's "Alice in Wonderland." This colorful, musical party ride lets you decide whether to spin wildly or remain gentle. If spinning is your cup of tea, you'll be dizzy with laughter. Tom Sawyer's Island - Tom Sawyer Island might be the most low-tech attraction in any park, but it remains a truly interactive experience. Tom Sawyer Island demands that you participate in order to enjoy the attraction. You have to climb the rocks. You have to explore the caves. You have to imagine. You will enjoy. Shooting Arcade - Looking for something for junior to do while everyone goes on Splash Mountain? Well, the arcade is a fun way to spend some time. The rifles are chained down, and work on infrared signals. As you aim at a window, a door, a buzzard, a can, a gravestone, and shoot....whistles go off, trains roll on, noise is made and sometimes a voice says, "Good shooting, pardner." Country Bear Jamboree- MUST SEE! - A fast paced, musical variety show, Country Bear Jamboree is a feast for the eyes and ears. Kids will howl with laughter and adults will be just as engaged. You'll be stompin your feet and clappin your hands before it's done, Guaranteed!! Splash Mountain - MUST SEE! - Welcome to Splash Mountain! You MAY get wet! This ride, based on Disney's 1946 film "Song of the South" takes you through the story of Brer Rabbit and Brer Bear. The ride boasts 103 audio animatronic figures. The flume-style ride features one of the tallest and sharpest flume drops in the world. Be aware, if you are sitting in the front, you WILL get wet! Big Thunder Mountain - MUST SEE! - This relatively mild coaster takes you through an abandoned gold mine in the old west. Try the "goat trick," by keeping your eyes on the goat as you descend the second hill for as long as you can. How mild is this coaster? The front cars of the train will bottom out on the third hill before the middle of the train even crests. Hall of Presidents - This amazingly lifelike show presents guests with all 42 American Presidents, from Washington to Bush, as Audio-Animatronic figures. Beginning this superior attraction is a film, narrated by poet Maya Angelou, that discusses the importance of the Constitution of the United States of America. Then the giant screen rises to reveal all of the American leaders, who are spotlighted and called by name, as each waves and nods. Mom and Dad will love it, kids won't. Liberty Belle Riverboat - The Liberty Belle Riverboat is an impressive stern wheel paddle steamer, reminiscent of the paddle steamers that used to ply the waters of many of the Southern states. Despite appearances however, It's not an original paddle steamer, having been built from scratch in dry dock at Walt Disney World. The steamer takes the guest on a very pleasant 17 minute ride past forest scenery, animals, and occasional events on the river banks. Haunted Mansion - MUST SEE! -999 happy haunts live in this mansion, but there's always room for one more....any volunteers? So begins the eeriest and one of the most frightening Disney rides. Guests board large "doom buggies", a mixed-up nickname for the Disney Omnimover system, which take them on a tour of the deteriorated old manor. This ride is more humorous than frightening, so it's safe for small kids. Even so, there are many surprises and a few scares, making this one of those rare rides that pleases almost all age groups. Now, if you think you're ready, we can ride the Haunted Mansion! We recommend you visit doombuggies It has EVERYTHING you would ever want to know about the Haunted Mansion. Walt Disney World Railroad - On the Disney World Railroad, guests can take a grand circle tour of Disney World on one of four authentic steam locomotives. The trains stop at Main Street U.S.A., Mickey's Toontown and Tomorrowland. Along the route, guests can see Splash Mountain, an Indian Village, It's A Small World and several examples of wildlife. 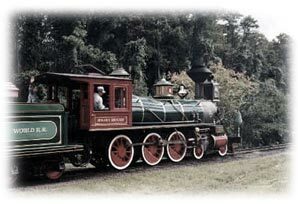 The Disney World Railroad was one of Disneyland's opening day attractions, and has taken millions of guests on trips around the park. Main Street Shops - As the gateway to the Magic Kingdom, Main Street transports you back to the turn-of-the-century architecture o fNew England and Missouri. At the Four Corners, each of the building styles represent unique architectures found in America. From the Exposition Hall to the Barber Shop, from City Hall to the Emporium, Main Street is lined with a diversity of shops hosted by cast members dressed for the period. Get a signature haircut at the barber shop, Disney souvenir at the Emporium, or sit down to eat at Tony's Town Square Pizza Restaurant. Mickey & Minnie's Houses- What better place to visit the "Big Cheese" than his own home? Take a tour of Mickey's home. Inside you'll find lots of fun items, such as oversized "Toon looking" furniture, and various bits of Toon humor. You'll also get to visit Mickey's Movie Barn, which is in Mickey's backyard and view some of his best cartoons, including Steamboat Willie, and The Band Concert. Continue "backstage" and you'll get to meet the mouse himself and have the opportunity for taking pictures. A Cast Member will also take a photo which you have the option to buy later at the Main Street Photo Shop. This charming walkthrough attraction will appeal to young children. Barnstormer at Goofy Farm - The Barnstormer at Goofy's Wiseacres Farm is the first attraction on the right as you move into Toon Town. The Barnstormer is a roller coaster designed like an old fashioned crop dusting airplane. The roller coaster swoops around curves, rushes through Goofy's barn, and up and down a few hills. It's very exciting and fast moving. It lasts exactly 1 minute. A roller coaster for beginning riders! This roller coaster is not extremely curvy, although the ride is over quickly. It would seem that you are Goofy in a barnstorming airplane. Indy Speedway - Burn up the track in this pint-sized version of a raceway. Real gas-powered cars can be driven by anyone tall enough to reach the pedal. Steer and control the speed of your own racecar as you "lap" up the excitement of this thrilling speedway. Formerly known as the Grand Prix Raceway, the Tomorrowland Indy Speedway is the closest anyone can get to real speedway driving! Carousel of Progress - MUST SEE! - Originally created for the 1964-65 World's Fair in New York, Walt Disney's Carousel of Progress is an interesting Audio-Animatronic show that demonstrates the improvements in American life due to electricity. The show is called a carousel because the whole seating area rotates around a central stage. The whole show is centered on one family and how electricity changed their lives from 1880 to the near future. ExtraTERRORestrial Encounter - This ride is closed. It will be coming back as Lilo and Stitch. Tomorrowland Transit Authority - Tour Tomorrowland in style with the Tomorrowland Transit Authority. Located below Astro Orbiter and above ground level, the attraction known throughout Tomorrowland simply as "TTA" takes you on a mile long journey throughout Tomorrowland. Space Mountain - MUST SEE! - Naturally, with such a famous attraction comes an infamous waiting line. So expect to be on your feet awhile before entering the 180-foot-high landmark dome of Space Mountain. Dubbed "Florida's Third Highest Mountain", Space Mountain is yet another classic ride that should not be missed. Roller-coaster-ride enthusiasts will be disappointed to learn that the ride's top speed doesn't break 30mph, but it feels as if you are traveling at twice that speed as you negotiate twists and turns almost completely in the dark. Special effects like strobe lights and streaking comets create a thrilling ride through the cavernous structure. Astro Orbiter - Ride a rocket ship, round and round, while getting a panoramic view of Tomorrowland. This is one of the more popular rides in the park, with LONG wait times. Buzz Lightyear Spin - Be a junior Space Ranger and pilot your Star Cruiser through imaginative, immersive worlds. You are the pilot as you careen through a comical cosmos! Go on a daring space mission to save the toy universe from the sinister Emperor Zurg. Spin and fire your personal laser cannon to score points. Good luck, Space Rangers!